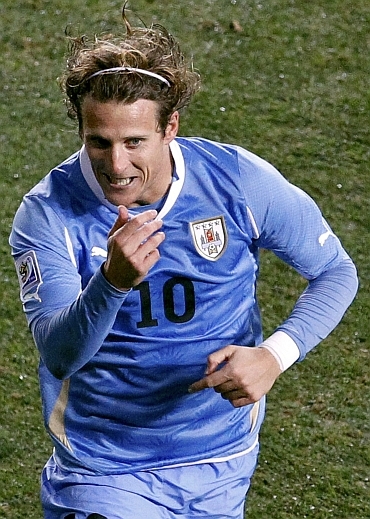 Uruguay's Diego Forlan [ ] won the best player of the tournament award on Sunday after lighting up the World Cup with some wonderful goals that helped his team become South America's only semi-finalist. The blond-locked striker won legions of admirers -- not least among South African women -- for his fantastic play on the pitch and courteous attitude off it where he always made time to sign autographs and chat with fans or journalists. Forlan took 23.4 percent in the "Golden Ball" poll organised by world soccer body FIFA [ ] and voted for by journalists. Dutch playmaker Wesley Sneijder [ ] was second with 21.8 percent and Spain's David Villa [ ] third on 16.9 percent. All three got five goals, making them joint top scorers along with Germany's [ ] Thomas Mueller [ ]. Mueller took the "Golden Boot" award given to the top scorer, using assists and number of minutes played as a tie-breaker. The German was also named Best Young Player. As well as winning the World Cup, Spain also took the FIFA Fair Play Award. Their captain Iker Casillas [ ] won the "Golden Glove" prize for best goalkeeper. Forlan's award will cheer Uruguayans after their side lost agonisingly to Germany 3-2 in the third place playoff. Spain emerged champions, beating the Netherlands 1-0 in extra-time in the final.